Can we make an even “edgier” brownie pan? What about the “perfect” brownie pan? 2012 just became the best year ever. How can we measure the “edginess” of this brownie pan? What would happen if you added a couple more horizontal partitions? What if you liked the center brownies? Could we make a pan to cater to these monsters? Similarly, what if you like brownies with three or four edges? Can we make an even “edgier” brownie pan by adjusting the partitions? Does the edginess change if we increase or decrease the dimensions of the pan? Develop a metric for the “edginess” of a brownie pan. I’m thinking surface area-to-volume ratio should do the trick. Plot the number of partitions against the “edginess”. Use Google Sketch Up to make a model of this brilliance. (Just go with me on this one) Take a poll. Figure out how many people like 1-, 2-, 3-, 4-, or zero-edged brownies, then challenge the class to make the “ideal” brownie pan. I’d also be willing to bet that someone more skilled than I at Geogebra could make a construction of this, complete with a diagram and a plot of partitions vs. edginess. 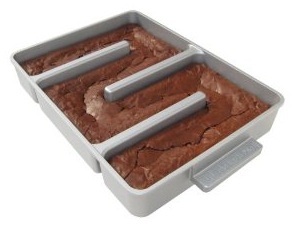 The more I think about it, the more I like that “ideal” brownie pan idea. But here’s my question: are there people out there than think two is not the ideal number of brownie edges? My fear is that the “ideal” brownie pan has already been made. And it’s available for $34.95 at Amazon. I just baked a boring rectangular pan brownies and I’d say the delicious edge is about 1 cm into the brownie. I really like this activity. So obvious for students to see why someone would want to maximize the edges. Good work! Thanks John! The only thing I’m left wondering is if, in fact, having two edges per brownie is idea for everyone. I mean, for me – sure. But does everyone feel the same way about brownie edges as I/we do? We have been around the block a few times on this bit of study.. The key is a balance between cooking time for adequate edge chewy, and number of pan edges. If you add more surface area (more pan edges) you achieve even baking. Even baking that results in a totally uniform texture. The key to an edge is that it is identifiable as part of a whole. All edge = hard. You need just enough edge rind to “center area” ratio. Couple that need with standard serving sizes..and you arrive where we did. 3 internal walls (that are open to the bottom of the pan) on a roughly 9″ x 13″ pan. Hi Matt – thanks for chiming in! I’m totally with you that there needs to be a balance between edge and chewy center. And that’s why I think this pan is perfect for my brownie needs. However, I wonder if that’s the consensus. After talking with Mrs. EmergentMath, she said she prefers the center brownies with NO edge (even at the risk of uneven baking). To me, that’s crazy talk. But I’m thinking of taking an informal survey on Google Forms or something to see if we can find the distribution of edge-preferences. For example, could we make a brownie pan that consists of 25% no edge, 25% one edge, 50% two edges, if that’s what the people want?